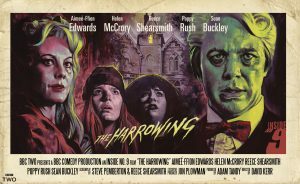 Inside Number 9 was Steve Pemberton & Reece Shearsmith’s acclaimed follow up to Psychoville. They brilliantly resurrected the anthology format in an homage to television series like “Roald Dahls Tales of The Unexpected” & “Hammer House of Horror”. Over six episodes six unrelated morality and mortality tales were told with different casts, the only link being Steve & Reece and the fact that each episode was set inside some sort of number 9, a dressing room, a gothic mansion, a suburban flat etc…. For Series 1 we created posters art with established poster artists to use on social media. These proved so popular that BBC2 chose to use them on air. 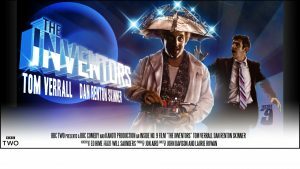 We also secured funding and support from BBC R&D Connected Studio Team to create a digital only episode of the series. Under the stewardship of Comedy Online Producer Jon Aird, writer Ed Hime, Digital Agency Kanoti, & with Steve & Reece’s feedback we created a story made up of hundred’s and hundreds of connected cinemagraphs. 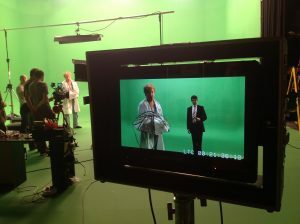 Ed’s script was recorded first with actors Dan Renton Skinner & Tom Verrall, who then had to visualise their audio work over two days in a green screen photography studio, being moved ever so slightly for countless photos as if they were taking part in their own stop frame animation.